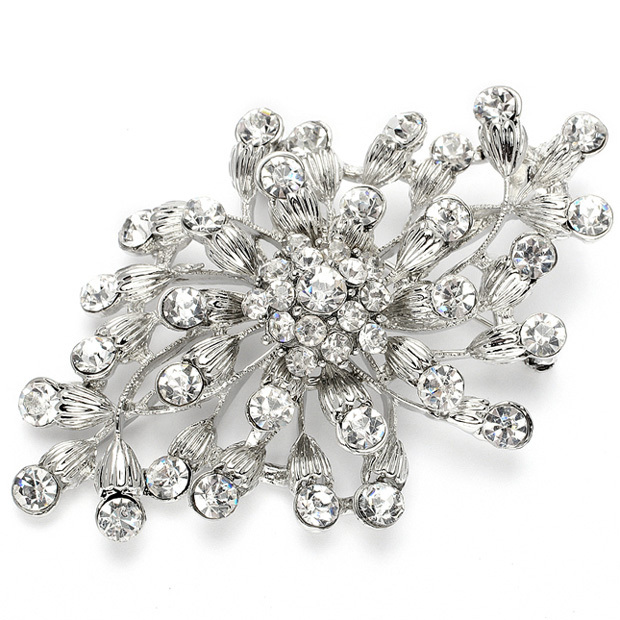 * This dazzling silver brooch by Mariell features delicate sprays of budding flowers each blossoming into a clear crystal. * Our popular pin is a chic way to embellish your gown, bridal belt, sash or faux fur wrap. * This brooch can be worn as a stunning comb with our adapter (sold separately). * The artistic design & fabulous low wholesale price make this wedding brooch a must-have in your store's showcase! * This 3 1/4" w x 2" h sparkling silver wedding brooch has dainty sprays of budding flowers with crystal blossoms. * This low-priced pin adorns gowns, bridal sashes, faux fur wraps & makes a ravishing hair accessory using our comb adapter (sold separately).